This was the site of Frederick Fletcher's storehouse (for his store across the street), which was converted to a store about 1848 by Erastus Field and Ferdinand Beach. They were succeeded by Beach and (L.B.) Howe from about 1852 till about 1866, Henry Field and Hira Percival till about 1872, John Percival and Edwin Oakes till about 1874, when the store and goods were destroyed by fire. 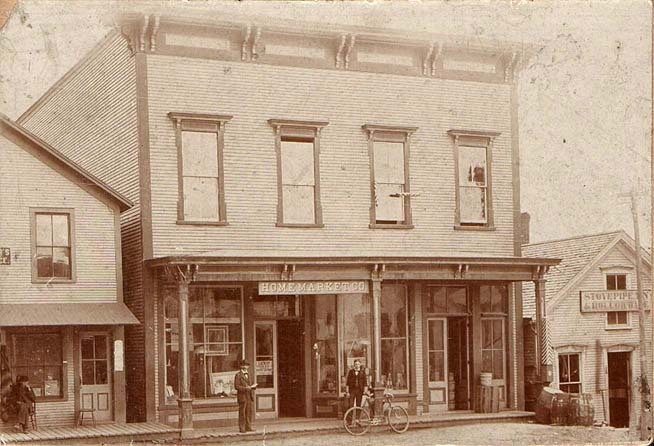 The building pictured was erected in 1881 by Wareham N. Pierce, who had previously been in trade at Jericho Center. He finished off the upper floor as offices and a Masonic Hall, which was occupied by McDonough Lodge. At one time or another, parts of the building housed offices of the WCTU, Arthur Bradford's print shop, Samuel Clark's boot and shoe shop, Joseph Gouther's barber shop, and Dr.Bradford's dentist office, in addition to Pierce's store. In 1891, the building was sold to the Home Market Company, who rented it to Suter and Lamphire, then to Charles Suter for a dry goods business on one side, and to B.A. Donaldson, who carried on a grocery business on the other side;the latter eventually occupied the entire store. The building burned January 11, 1901, along with D.E. Rood's harness shop adjoining on the east (left in the photo), and the tin shop and dwelling house of Joseph Bissonette on the west. In 1928, a small building was built on the original Home Market foundation by George Ladeau, who sold it in the early1930's to Fred Greenough. He converted it to a meat market, and also solda few groceries; he also added an ice house in back to sell ice for refrigerators. Later the building was sold to Emile Grenier, who used the store space for a barber shop, and the ice house to operate a wood working business for a time; he then renovated the buildings as living quarters,the shop area was rented to John Moiles, and the woodworking shop was rented to the Lessor family. Then after being vacant for a time, the building was acquired by Brown's River Maple Products for a sales area and gift shop. It was then converted to a beauty shop, and was destroyed when a truck ran into it, being replaced by the current building. 1) Oldest photo, of Home Market building - sign in center door is about a steam laundry - while not clear, it appears that this was a drop off point for laundry to be taken to a steam laundry located elsewhere for washing. Sign on building on right, part of Bissonette's Tin Shop, says "Stovepipe, Tin & Hollowware"
2) Other old photo says on bottom: "Park, Jericho, Vt.", and is taken from just below the Jericho General Store looking down the hill to the site of the Home Market building, the foundation of which can be seen in the right background The Home Market building burned January 11, 1901,and the hotel building on the right burned in November, 1904, so this photo was taken between those dates.